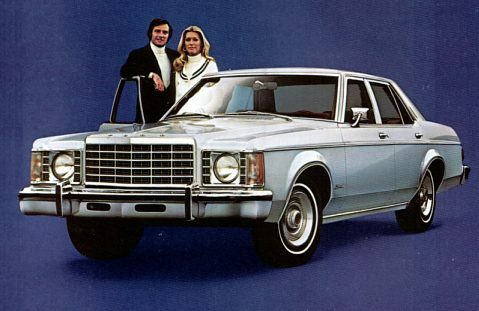 Offering elegance in a new and efficient Euro-size, Ford's 1975 Granada was popular with Canadian consumers. 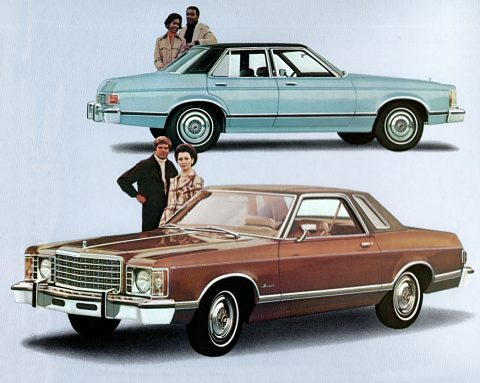 Few new automobiles in the 1970s were as eagerly anticipated as Ford's Granada. It was small, luxuriously appointed, upscale and promised a fit and finish on par with European workmanship. It was economical and--goodness-gracious--if it didn't look a lot like a Mercedes-Benz 280. 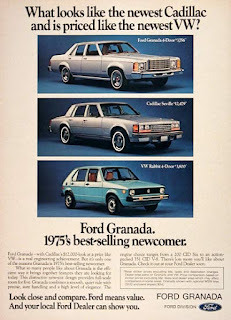 Granada was the right car at the right time for the North American market. 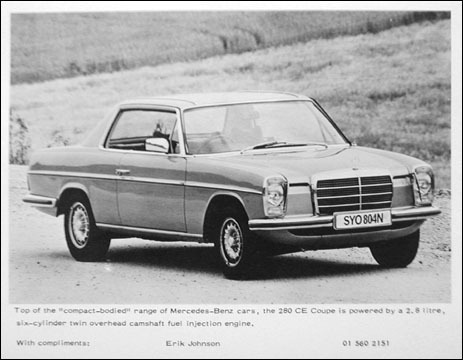 The 1975 Mercedes-Benz 280. A European model is seen here. Canadians had watched nervously as a monumental gasoline shortage had crippled the United States in 1973 and 1974. Service stations closed for lack of fuel. Some States instituted rationing. Not since World War Two had there been such a scramble to keep one's car on the road. Though our domestic supply was never threatened, practical Canadians thought long and hard about what new car would deliver the biggest bang for the buck. Despite the federal Price and Wage Control Board's efforts, Canadians still paid 20% more than our American neighbours for the exact same automobile. An automobile was a major purchase and operating expenses were taking a bigger and bigger chunk out of the household budget. The 1975 Ford Granada Ghia was subdued and subtle in its styling. The domestic market had developed into its own, reflecting the unique lifestyle values, habits and characteristics of Canadians. The emergent picture looked very different from that of the Americans. The profile of the average Canadian buyer was young and urban. The 20-to-30 age bracket was rising rapidly. The three major markets were concentrated in Vancouver, Toronto and Montreal. With first-class mass transit systems at the disposal of the majority of consumers, only 18% of Canadians kept a two-car stable--a full 10% fewer than in the USA. We drove our cars for much longer periods of time than did our southern neighbours--the annual scrap rate was only 60% here at home. Americans were buying smaller and smaller cars but the trend in Canada was slowly shifting to full-sized cars--50.3% of Canadians bought full-sized land yachts in 1972 and that figure drifted upward to 53.7% in 1975. Conversely, American consumers abandoned the traditional big cars. During the same three-year period sales of full-sized automobiles plunged from 62.3% to 48% in the US. While Americans were buying small domestic and foreign cars in every increasing numbers, Canadians were finished with their foreign flings and returning to North American-made vehicles in all shapes and sizes. Only 13% of all new cars purchased in Canada in 1975 were imported from Europe and Asia, the lowest figure in years. Ford dealers gave away a little comparison book entitled, The Closer You Look. This author was curious enough to wander into the local Ford dealer in Saint John, New Brunswick in hopes of trading his year-old Datsun B210 for a new Granada. The salesman didn't look twice at the Japanese econo-box. He couldn't sell it; there were simply no prospects. 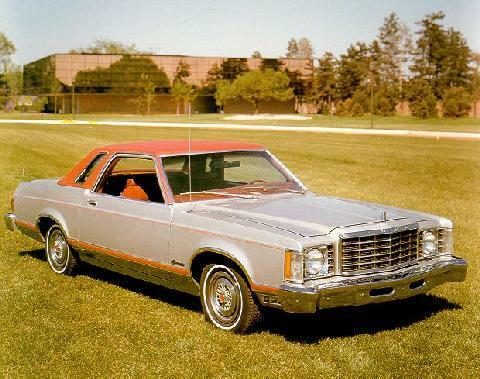 The 1975 Ford Granada Ghia Coupe weighed in at 3,698 pounds. And that's why Granada--like Baby Bear's porridge--was 'just right' for the Canadian market. This newest Ford was compact in size , sharing its wheelbase and mechanicals with stablemate Maverick. 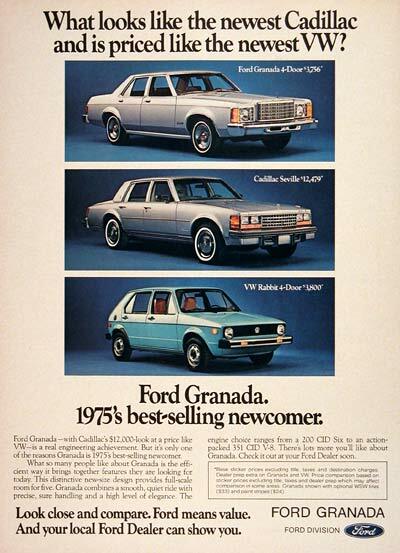 Granada was refreshingly sophisticated with its clean, contemporary European styling. Advertising called the look "trim" and "personal." 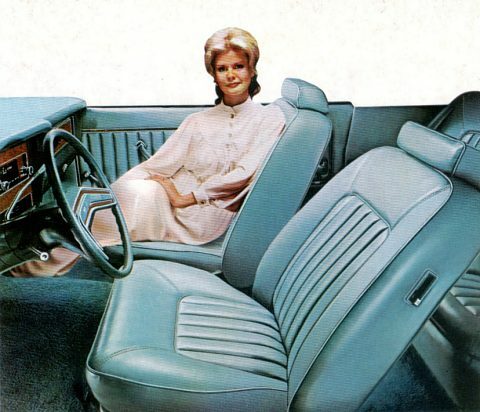 Granada's interior was absolutely resplendent from the burled walnut 'woodtone' accents and the 199-position adjustable seats covered in a cashmere-look nylon to the 12-ounce shag carpet beneath one's feet. Solid state ignition, front disc brakes--every touch showed that Dearborn's engineers and designers had done their homework well. Engine choices started with the 250-cubic inch six mill. Ford's tried-and-true 302 and 351 V8s were economical options that gave a little more oomph when scuffing down the Number One Highway. Canadian owners were advised by Ford of Canada that all its engines--save the 2.8-litre V6--required the newly introduced unleaded gasoline. Granada's base interiors were finished in vinyl but one could upgrade to a cashmere-look upholstery or go whole hog with leather. There were two Granadas to choose from. The luxurious base model came in two- or four-door configuration along with a pair of sumptuously upscale Granda Ghias. The fancy dress version got a vinyl roof in a choice of eight colours, "floating pillow" seats, 22-ounce shag carpets to sink one's feet into, map pockets, mother-in-law hands for ease in exiting and a digital chronometer (that's a clock, to you and me). White sidewall, steel-belted radial ply tires were standard equipment. 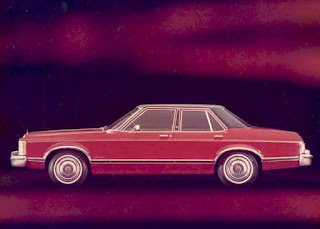 The upscale Ford Granada Ghia offered no-cost extras as pinstripes and a driver's side remote control mirror. There were options galore including SelectAire air conditioning, Cruise-O-Matic transmission numerous radio, stereo and cassette tape player combinations, power steering, and power windows, a power sun roof, a deck lid luggage rack, an electric window defroster and a rear window--fan operated--window defogger. The leather-wrapped steering wheel was the perfect compliment to Ultrsoft leather upholstery offered in dark red, silver blue or tan. Of course, there were simulated-spoke aluminum wheels. The 1975 Ford Granada and the 1975 Mercury Monarch bow to the public. Granada was just of a a slew of new nameplates introduced by the Big Four in 1975. Along with its Mercury twin--the Monarch--and the mid-sized Ford Elite (no longer part of the Torino series) there was AMC's revolutionary Pacer. 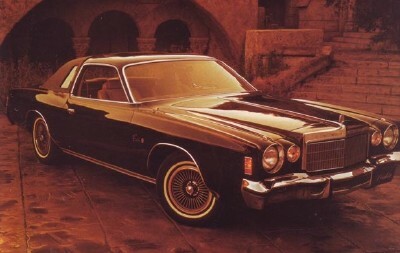 GM placed Monza, Seville, Skyhawk and Starfire on the market and Chrysler fielded the beautiful Cordoba and the sleek Charger SE. Initially, North American production of the "precision-sized" Granada was at the Mahwah, New Jersey plant. It wasn't long before the slow-selling Maverick was shunted aside from the Wayne, Michigan factory and Granadas rolled off the lines there, too. Of the 302,650 units produced during the model year, a total of 61,353 Granadas were exported, virtually all of them to Canada. 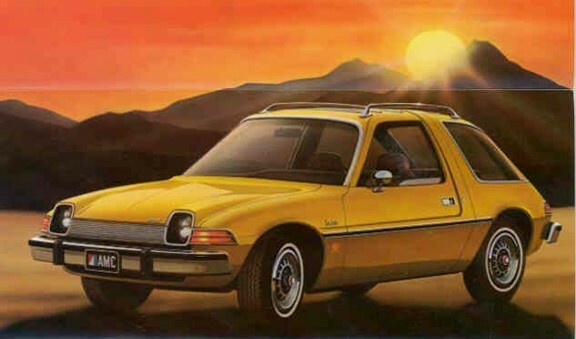 The most unusual offering for the 1975 model year was AMC's Pacer. American dealers would struggle with recession but 1975 would turn out to be a the Big Four's best ever year in Canada as consumers from St. John's to Victoria put down their money for 850,903 new passenger cars. That figure was up a whopping 6.8% over the previous year. A notable part of that increased was prompted by the 7% tax rebate on automobiles declared by the Province of Ontario in a bid to stimulate sales and therefore increase jobs. There was a downside to Granada's popularity. 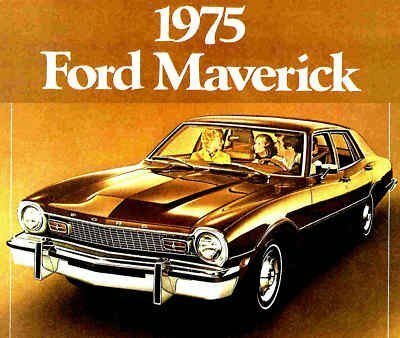 It tole sales from other Ford lines, principally from the compact Maverick and the mid-sized Torino. At year's end, sales were off by 3.8% and earnings were off, too. Still Ford of Canada Limited could lay claim to a full 25% of the market with 212,422 passenger car sales. Its truck division garnered another 107,199 sales, taking 37% of the domestic truck market.